Since this is my 10th anniversary year of meeting Ruiz and hearing him speak, when it was suggested to me that I re-read his book, I was open to the idea. We all know first-hand how powerful words are in life. One beautifully said word can send your heart and mind soaring into outer space without leaving the earth. Take a 180 degree turn and a hateful word can take us to the bowels of depression. That is a very simple and true explanation of what really happens when we use ugly words. I was the recipient recently of ugly words, and I was really angry at the person who said them, and others who knew about it were angry at this person also. It can and does backfire on you to call anyone out. Ruiz encourages us to speak with integrity. Say what you mean and avoid the ugly and the gossip. Use your word in the direction of truth and love. We all know kind and caring people who actually can mentor us to be more impeccable with our words. I talked with one such person recently and I wish I could attach her to my hip and walk around with her all day. We are human, we fail, and being impeccable with our words takes work. Ruiz wrote that it takes practice. I want to be a better person, I want to be more impeccable with my words so I plan to practice. We all know you have to want to do something to become something. 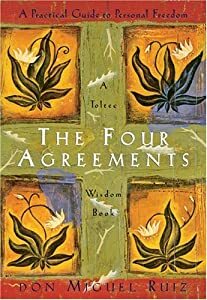 I really hope I have opened the door to more people reading “The Four Agreements“, we can all be in a better place when we practice what Ruiz preaches.